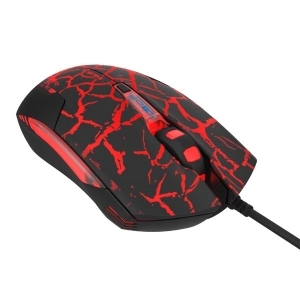 The mouse is especially designed for games, and it will meet the needs of the current mainstream games. With professional game chip and quick button response, it will effectively help you aim the target, beat your opponent and win the game. It will bring you a better gaming experience. Built-in A5050 game chip, especially designed for games, and it is easy to meet the needs of the current mainstream games. 4 modes of adjustable DPI which can be adjusted by the button in the top to help find the precise position. 3 modes of return rate which can be adjusted by the button in the bottom to help avoid dropping frames. 4 colors adjustable backlight effect(red, blue, purple and green) and LED logo light effect, very fashionable. The material of the mouse's surface is skin-friendly, very comfortable to use under your palm, and the mouse's roller is made of rubber material. The USB weaving wire is with anti-interference magnetic ring, which will ensure controlling the game smoothly to provide you a stable gaming environment. It can directly to plug and play. Suitable for playing game, using on office and at home.